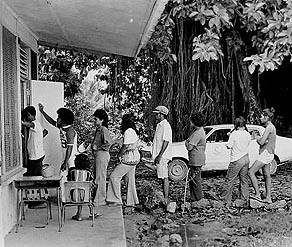 "Voting on the Micronesian constitution, July 12, 1978, Palau." Photograph from the Trust Territory of the Pacific Archives. "After the war, when the administration turned over to Americans, we had to start from scratch," Masaharu explains. "During the Japanese period, most of the administration was done by the Japanese. Running the schools, running the government, the judicial system—everything was run by the Japanese government. That is why Americans started training for Palauans. They introduced the new system of government, like the legislature and the magistrate. Then each village started to develop their own system of government." “Of course Palauans had their own system of government a long time ago: the chief and the councils of chiefs are the government of each village. The Japanese utilized them to some extent for their own purposes. "When the Americans started, they understood that the chiefs still carry their power and responsibility, and are most respected in their community. So they used the chiefs too. At the same time, they introduced a new system of democratic government where we have to elect a leader. “And so each municipality has elected leaders—a Magistrate and a Council—in addition the Palauan system of chiefs." 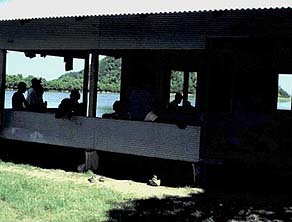 Palauan meeting center, 1978. Photograph from the Trust Territory of the Pacific Archives. 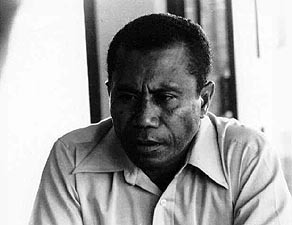 Roman Tmetuchl, who later became Ngiraked of Airai Village, was an important figure in Palau's path to self-governance. Photograph from the Trust Territory of the Pacific Archives. "That’s when they started calling the villages ‘municipalities.’ And each municipality began the chartering its own system of government. Later when we had the Constitutional Convention, they changed the name from ‘municipality’ to ‘state.’ But that is how they started this system. “So the American impact is that they didn’t ignore the council of chiefs. They used the council of chiefs at the same time that they introduced a new system, and they tried to work these two systems together. "I don’t know if it was really successful, because right now we have a lot of problems with how the power of the chiefs and the constitutional government works in each state. Some would like to include the chiefs in their elected systems, but others don’t. So it is becoming a more problematic system now." “I think right now it is working okay, except that people need to be educated on how the system works. Some are mixed up about the system and that is probably where the problems come. Some chiefs want to become a governor or something like that, to get both powers, and I think that maybe it is not a good idea to have a person who holds the title of a chief and is also a governor. He would get too much power, and he could flip back and forth. He could do things as a chief, he could do things as a governor, so to me that wouldn’t be very good." 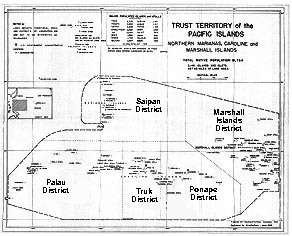 “The Trust Territory was run with the six districts: the Marshalls, Pohnpei, Chuuk, Yap, Palau, and the Northern Marianas. The United States, I think, wanted to hold them together. The Northern Marianas was the first one to decide not to be part of Micronesia as a whole. And the United States agreed to that. So they sort of negotiated separately to get their status as a Commonwealth of the Northern Mariana Islands.
" 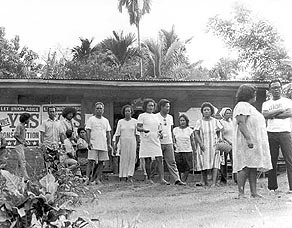 From that, I think, Palau and the Marshalls decided, ‘well if they can do it, we can do it.’ And our leaders thought that if we are separate, it would be better to be separate than in a group. I think some of the reasons are that, even though we are all Micronesians, we have different customs. We have different ways of doing things. And to be together with six different cultures and systems of government—our traditional governments and the ways we do things—probably may not be a good idea." 1948 U.S. Military map of the Trust Territory. Bags of copra. 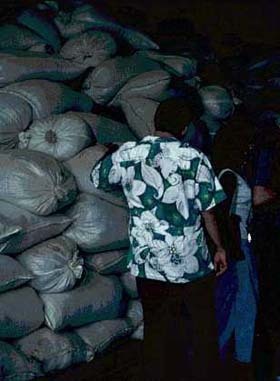 By the 1970s, the copra industry in Palau had made a comeback. Photograph from the Trust Territory of the Pacific Archives. “Another thing was that we saw Palau’s economy moving ahead, and we probably thought that we would get more money to put into a central government. Palau had such a small population, at the time we didn’t get that much money, while other districts like Chuuk and Pohnpei who have bigger populations would get more money. If you are going to distribute the money according to population, we wouldn’t get much, but we would contribute more because our economy is better. So I think they decided that it is better to be separated. “At that time we had some political education. Palauans didn’t really want to be part of United States. Certain groups were really strong that they wanted to be independent. Other groups said, ‘well, independent, but maybe free association is better.’ A commonwealth? No. We didn’t want to be part of U.S., where the United States would have direct administration over us." 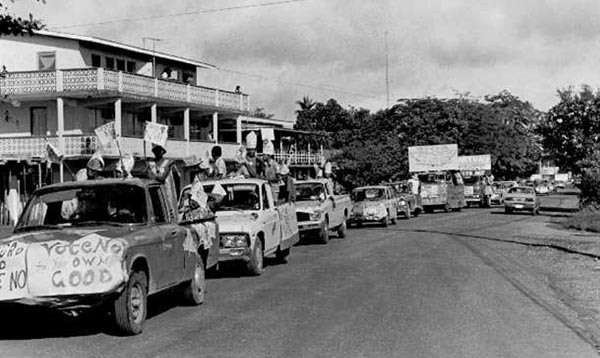 "Vote No" parade in Koror, regarding the constitution that would have kept Palau part of a united Micronesia. 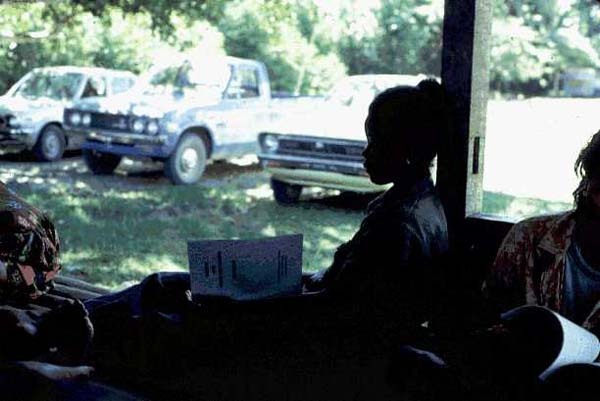 Photograph from the Trust Territory of the Pacific Archives. “So the United States agreed to have a separate negotiation. That is when we started separating. They negotiated with the Marshalls. They negotiated with FSM, they negotiated with Palau, and there we get our Compacts of Free Association—three for the three entities. I remember we had our Compact almost the same time as FSM and Marshalls, probably earlier. But the Marshalls and FSM approved their Compacts first, so they became independent earlier than Palau." “The process to approve the Compact here was very difficult, because the United States wanted nuclear accessibility to the island, where their ships with the nuclear power can come to the island. And so the big issue was the nuclear thing. "Palau didn’t want any ships run by nuclear power to come to Palau, or any storage of nuclear materials or anything to do with nuclear. And our constitution stated that in order to approve such an amendment, to approve the Compact—it has those criteria that United States would have access, and bring a ship that has nuclear power to the islands—we needed two-thirds’ majority vote of all the people. And that we could not do." 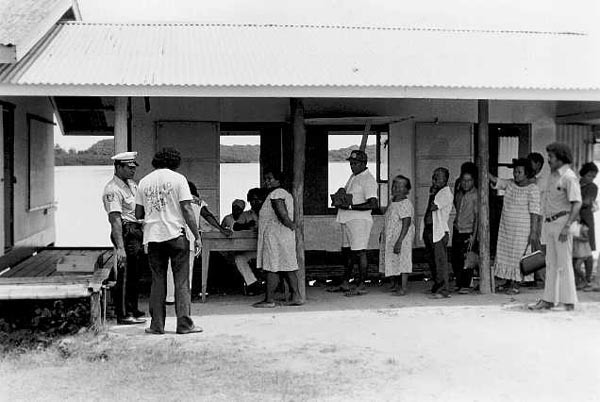 "Palauan voters." 1978. Photograph from the Trust Territory of the Pacific Archives. “Five times we voted. We could not get two-thirds, so we could not implement our Compact. Finally, we did amend the constitution so that the vote will not require 2/3s majority to approve the Compact, but only a simple majority, 50% plus one vote. We amended our constitution to lower the voting requirement. “Then when we had the referendum, the majority of the people—which was more than 50%—said it is okay. So in 1994 we implemented our Compact. "As for U.S. nuclear-powered ships, they have accessibility. They can come, but they have to notify us, I think. But storage? No. That is absolutely no. But I think that it is possible that they can bring a ship, but they have to notify us." "Woman with political brochure, 1978." Photograph from the Trust Territory of the Pacific Archives. “An important change after the Compact of Free Association is our ability to negotiate with other countries, and get assistance from other countries. Japan especially is offering foreign aid to Palau. "Within the Compact of Free Association there are certain things that the United States is supposed to do, like building the new Palau Compact Road. And so with the Compact treaty those things became a reality. Before that, we had to go to Washington to negotiate the project. But now we don’t have to—they have stated in the Compact treaty that we have so much money. They have already given us that money and we have invested some of it, and every year we get a certain amount, so we don’t have to go to Washington to justify our budget. "We have the budget because of the Compact treaty. It is an allotment automatically given to us, provided we do certain things. So that is helpful. I think that is when we started moving faster, because the resources are here and we can expend them easily." The changes brought about with this new political status and financial backing projected Palau rapidly into a more modernized state. With these rapid changes, questions arise about how to keep cultural aspects intact as Palau and Airai move onwards into the future.